Top tips for making sure your ladder is safe. Do not use a damaged ladder for working at height. They represent a major safety risk. Before starting work at height, make sure that your chosen ladder is in good condition, with two non-slip feet and rungs all sufficiently secure and clean. Ladders classified as BS2037/BS1129 Class 3 are designed for domestic use only. They should therefore not be used in any workplace. Ladders classified as EN131 are suitable for trade and industrial use, while those classified as BS2037/BS1129 Class 1 are suited to heavy duty and industrial use. Never use a ladder for a single task for more than 30 minutes in the same position. Use tool belts and other methods to keep any required tools close at hand when working at height. That way, you won't have to carry so many items by hand. If you must carry items, however, then make sure you keep one hand free to grip the ladder. Take care when positioning your ladder. Make sure it's not in a position where it's likely to be struck by passing vehicles or other hazards, should as opening doors. 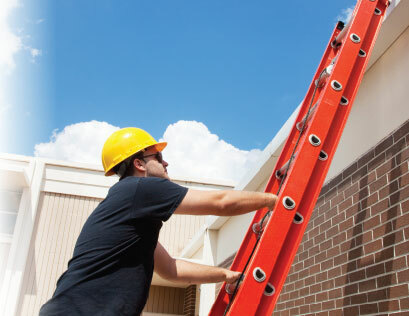 You should also ensure that any pedestrians can pass around your ladder without difficulty. If necessary, recruit another person to hold your ladder in place while you work. Avoid overreaching. Keep your belt buckle inside the stiles and position both feet on the same rung of the ladder while you work. Do not exceed the ladder's stated maximum load. Wear a hard hat while you're working. The Working At Height Regulations Explained. The Work at Height Regulations 2005 provides a framework intended to reduce the risk of accidents when working at height. They are applicable to all work at height where there may be a risk of falling and, subsequently, personal injury. The Work at Height Regulations impose certain responsibilities not just on employers, but also on the self-employed and those responsible for others working at height - this would include facility managers and building owners, for instance. Ensuring that all work at height is properly planned and organised. Those working at height are competent to do so. The risks involved in working atheight are adequately assessed and accounted for, with appropriate equipment supplied and used for the work. Equipment used while working at height is properly maintained and inspected. Any risks posed by fragile surfaces are properly accounted for and controlled. Working at height should be avoided if at all possible. Precautions must be taken to reduce the risk of falling/injury where working at height is unavoidable. Where the risk of a fall cannot be reduced significantly, steps should be taken to at least minimise the distance (and, therefore, consequences) involved. There are various other provisions in the Work at Height Regulations; they include schedules detailing requirements for existing workplaces, means of access for working at height, collective fall prevention (through the use of guardrails, working platforms, etc), collective fall arrest (e.g. nets, airbags), personal fall protection (e.g. fall arrest, work restraints, rope access) and ladders. Further information on this is available at www.slingsby.com/healthandsafety. Care must also be taken to ensure that any ladders used when working at heightare well-maintained and sufficiently robust. Old and/or damaged ladders pose a major risk to personal safety and should therefore never be used. Take a look at the following product highlights, which illustrate the main differences between the types of access products on offer. This might help you to establish which product would be most appropriate for your needs. Kicksteps - Kicksteps or mobile stools have small castors on the base which retract when stepped on and can be easily positioned. They are lightweight but have a fixed height. Step Stools - Ideal for use in office or domestic environments, they are often foldable for easy storage, and many come with large treads for added safety. Step Ladders - A range of steps which meet the BS EN 131 light duty / trade use standard. Used for occasional short jobs at height. Ladders- Used when a job is too high for a set of step ladders. Many ladders these days are telescopic or transformable into different types of ladder / step combinations. Warehouse Steps - Heavy duty steps, which are usually mobile and often have retractable castors for complete stability. Many have handrails and extra large treads to ensure safety when carrying goods. Work Platforms- These need to be used when working at height for longer than 30 minutes. They come with safety bars and handrails, and some can be folded for compact storage.